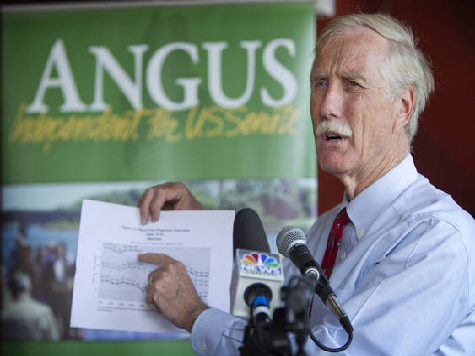 Sen. Angus King (I-ME), who caucuses with the Democratic Party, pointed out Wednesday that while the GOP has plenty to criticize in President Barack Obama’s foreign policy, its own foreign policy is muddled. Worse, he noted, the Republican Party seems to be in two minds about the constitutional powers of Congress, suing the president over his changes to Obamacare but urging him to go to war against ISIS without a congressional vote. Chris, I’ve been saying it for the last 24 hours, you know what Congress is really good at? Second-guessing and criticizing. We’re not very good at taking responsibility. And I think we’re dodging our responsibility. It is ironic as you mentioned that some of the same people who are suing the president for being too active as an executive, are now saying well, we’re not going to get involved in this decision about war. There are some Republicans who have urged Congress to involve itself in the issue–especially after the Obama administration failed in a short-lived effort to cultivate congressional support for strikes on Syria a year ago. However, many have been content to allow Obama to take action on his own, outside of the authorization that Congress has already provided, to avoid a politically difficult vote on the eve of midterm elections in November. One argument Republicans have made to justify refusing to take responsibility is that Obama has failed to make a clear plan or to outline a convincing strategy. That impression was likely reinforced by Obama’s poor speech on ISIS on Wednesday night. Yet Obama’s hapless leadership is actually an argument for more congressional oversight–to provide necessary guidance, and to deny support for war if the president will not fight to win.